Whether you use your home office to run a business or just your personal life, organization is crucial. Offices are one of the most difficult rooms to get in order, particularly if they are frequently used. 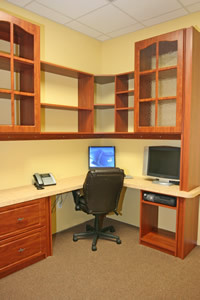 Pre-made desks can’t always accommodate filing systems, extra computer equipment, or decorative elements. 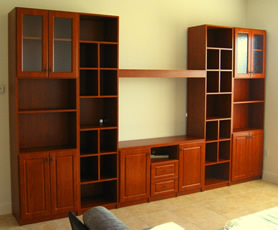 If you’re looking to remodel or design a new home office in DeLand, DeBary, Port Orange, Ormond Beach, Daytona Beach, Lake Mary, Sanford, Orlando, Winter Park or any other Central Florida area, contact us today to begin planning with our master woodworkers! 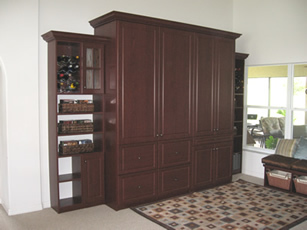 At A Perfect Closet & Cabinet, Inc., we can build your office system to include lateral file drawers, pull-out trays for printers and other equipment, floor-to-ceiling custom bookcases, and/or adjustable shelves for knick-knacks and accent pieces. 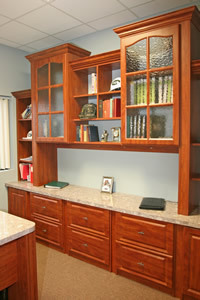 Our customized office designs are always built for each customer’s individual needs. Most office furniture is purchased for its functional value rather than its appearance, resulting in a hodge-podge of mismatching pieces. If you have clients visiting your workspace, a professional-looking office is crucial. 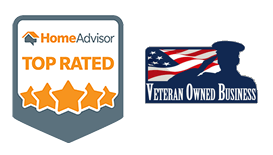 A Perfect Closet & Cabinets, Inc can build a unified office system (not just random batches of furniture) that caters to your company’s specific needs. Make sure your workspace is a comfortable, relaxing environment that you will want to work in. Your productivity depends on your efficiency; leave the organizing to us. Living rooms are the most-used rooms in any house. You entertain guests and spend time with your family in this room, so any extra space is highly valued. 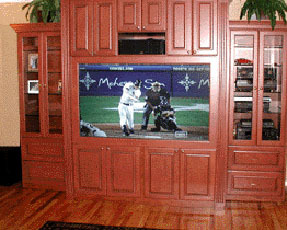 Custom-designed home theater furniture by A Perfect Closet & Cabinets, Inc puts your media equipment on the wall instead of the floor, giving you more floor space. 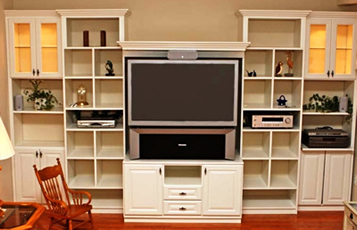 TVs and audio visual equipment come in many different shapes and sizes, making it hard to find the appropriate storage system for your room’s decor and dimensions. 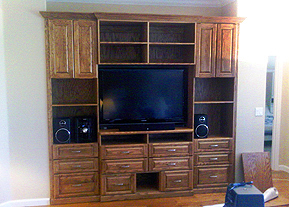 A custom entertainment center by A Perfect Closet & Cabinets, Inc, however, can efficiently utilize wall-to-wall and floor-to-ceiling space to accommodate all your audio visual equipment and accessories. 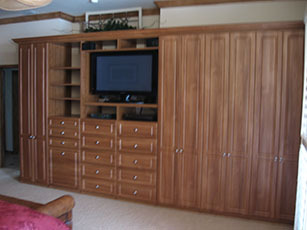 A Perfect Closet & Cabinets, Inc can install bookcases, adjustable shelves for displaying items, or entertainment systems with pull-out trays for DVDs or CDs. 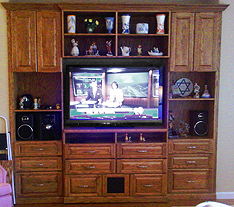 A matching system creates a seamless, cohesive design in your living area.